How to Convert Text to WAV File Using Text-to-WAV Wizard? Convert text to wav files from your emails, news articles and any text you want! 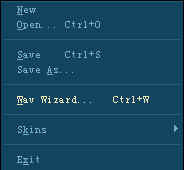 Step One - Select "Wav Wizard" from File menu. Step Two - Select the voice you like, the output path and wav filename, and writing speed, then click "Next". Step Three - Type or paste some text to the edit box, then click "Convert". The the program will start to convert text to wav file. Step Four - Wait for converting text to wav finish, then click "Exit" button to exit Wav Wizard. 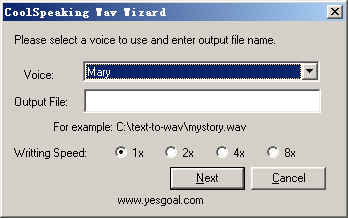 This setting controls the speed at which CoolSpeaking attempts to convert text to WAV file. 1x means converting is done at the same time as reading aloud. 8x means converting to file takes 1 eighth the time as reading aloud.